A quartet of giant conger eels are setting in to their new shipwreck home at Bristol Aquarium. The eels share their new display with a variety of other native species including sea bass, cuckoo wrasse and ballan wrasse. The eels, which currently measure around a metre in length, came from the National Marine Aquarium in Plymouth. 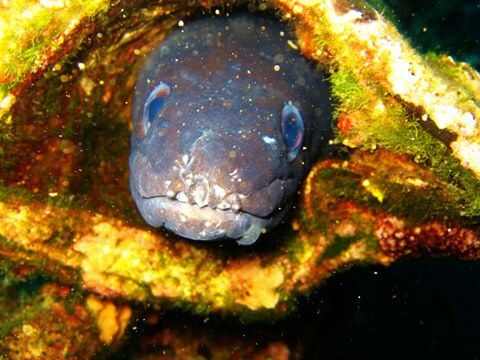 Bristol Aquarium’s Philip Jane said: “Congers are one of the largest eel species in the world. “They are a familiar site to UK wreck divers as they tend to take advantage of any available nooks and crannies to rest up in during the day before venturing out at night in search of prey. “Our eels have settled in really well and have already picked their own hidey holes. However they have still got a lot of growing to do as adults have reportedly been recorded in the wild in excess of three metres in length, and an individual weighing more than 95kgs was caught off Falmouth in Cornwall,” he added. Found from Norway and Iceland in the north to Senegal and the Mediterranean in the south, the eels have been found both in shallow waters close to shore and up to depths in excess of 4,000 metres in the deep oceans. During the day congers are found in holes or crevices on rocky or sandy bottoms and in wrecks and other artificial environments. They become more active at night when they leave their lair to go in search of prey. Issued by Bristol Aquarium. For more information and to arrange picture/interview opportunities please contact Philip Jane or Sarah Moore on 0117 929 8929.